Dr. Valery Radchenko is a research scientist at TRIUMF with a primary research focus on production and application of therapeutic radionuclides for Targeted Radionuclide Therapy (TRT). Dr. Radchenko is a radiochemist by training, and graduated from Saint-Petersburg State Technical University (Russian Federation) in collaboration with Joint Institute for Nuclear Research (JINR) in Dubna (Russian Federation). He received his PhD from Johannes-Gutenberg University Mainz (Germany) in 2013 with a thesis focused on design of production of promising radionuclide for immuno-PET: 90Nb. In realizing the potential of targeted therapy, Dr. Radchenko pursued a postdoctoral position at Los Alamos National Laboratory (LANL) in New Mexico, USA, where he worked as a part of tri-lab effort on production of 225Ac from spallation of thorium with high energy protons. In addition to 225Ac production, he also worked on other efforts including extraction of valuable medical radionuclides from irradiated thorium targets, such as 223/224/225Ra, 230Pa, 103Ru/103mRh and 111Ag, while also testing production of alternative candidates for low energy (≤ 35 MeV) slot at LANL Isotopes Production Facility (44Ti/44Sc and 119Sb). To date, Valery has published over 30 scientific papers in peer-reviewed journals and currently is guest editor on special issue on 225Ac for Journal of Current Radiopharmaceuticals. Dr. Causey is a Research Scientist at the Chalk River Labs of Canadian Nuclear Laboratories (CNL), working in the Radiobiology and Health Branch. Patrick's research is focused on the production of alpha emitting therapeutic isotopes with the purpose of developing pre-clinical agents for cancer treatment. Patrick earned his PhD in chemistry from Queen’s University, under Dr. Mike Baird, researching the design and synthesis of small metal-based drug molecules for use as chemotherapeutics. Patrick then completed a post-doctoral fellowship with Dr. John Valliant (McMaster University) studying the radiochemistry of targeted small molecules incorporating radiometals 99mTc for diagnostic imaging and 186/188Re for therapeutic applications. He then transitioned to the McMaster Nuclear Reactor, where he worked as a Research Scientist with a team of investigators looking at radiochemistry of reactor produced radioisotopes. Upon completing a two year term in this position, he joined the newly created Centre for Probe Development and Commercialization (CPDC), a Government of Canada not-for-profit Centre of Excellence. At this time, he was responsible for process development and Quality Control of clinically produced radiopharmaceuticals reaching 1000’s of patients per year. Upon returning to the area where he grew up and starting work at CNL, he joined his current Branch to work on the development of a radioisotope generator system for the production of isotopes useful in Targeted-Alpha-Therapy. Alfred Morgenstern received his PhD in radiochemistry from Technical University Munich in 1997 and subsequently pursued his postdoctoral research at Florida State University, studying the chemistry of plutonium. He joined the Joint Research Centre of the European Commission in Karlsruhe in 2000, and for the last 15 years his research focused on targeted alpha therapy. He is leading the project on targeted alpha therapy at JRC Karlsruhe and has been co-organiser of the series of international TAT symposia since 2004. Kohshin Washiyama received his B.Sc. in 1997, M.Sc. in 1999 from Kanazawa University while studying the mechanism of photonuclear fragmentation under the guidance of Professor Koh Sakamoto. Thereafter, he worked as assistant professor at Kanazawa University from 1999-2017. He worked to make and apply isotopes for medical use, especially alpha emitters, while obtaining a Ph.D. under the supervision of Prof. Ryohei Amano in 2005. While an assistant professor at Kanazawa University, he was a visiting researcher at the Department of Radiation Physics, Institute of Clinical Sciences, Sahlgrenska Academy, University of Gothenburg. in 2012-2013, and a visiting assistant professor at Duke University Medical Center in the research group of Prof. Michael R. Zalutsky in 2016-2017. Washiyama was one of the organizers of the 10th International Symposium on Targeted Alpha Therapy (TAT-10), which was held in Kanazawa, Japan in 2017. He is presently employed at Fukushima Medical University as an associate professor. Ekaterina Dadachova received her Bachelor in Chemistry and PhD in Physical Chemistry degrees from Moscow State University in Russia. She did her postdoctoral studies in radiopharmaceutical chemistry at the Australian Nuclear Science and Technology Organization (ANSTO) in Sydney, Australia, followed by a stint as a Visiting Associate at the National Institutes of Health (NIH) in the USA. She subsequently held a Professorship in Radiology, Microbiology and Immunology at the Albert Einstein College of Medicine in New York, USA. She is currently a Silvia Fedoruk Center for Nuclear Innovation Chair in Radiopharmacy and a Professor at the College of Pharmacy and Nutrition at the University of Saskatchewan in Canada. Her laboratory has pioneered radioimmunotherapy (RIT) of infections including fungal and bacterial infections and HIV. She has been recently awarded an Establishment grant by SHRF to treat dogs with blastomycosis with RIT. Her other research interests are radioimmunotherapy of melanoma, cervical and pancreatic cancer as well development of melanin-based radioprotectors. Her research has been funded by NIH, US Department of Energy (DOE), US Department of Defense (DOD), Bill and Melinda Gates Foundation and private industry. She has 150 published peer-reviewed articles, 10 book chapters, and has 6 granted US patents and 5 US/PCT patent applications. She received several awards such as Philips Young Investigator Award by RSNA, Young Professionals Award from the SNM, Mary Kay Ash Research Award, Top 10 researchers at Einstein in 2013, and from 2014 she holds an Extraordinary Professorship from the University of Pretoria, South Africa. Mark is a NNL Laboratory Fellow specialising in actinide chemistry with over 16 years’ experience. With expertise in reprocessing chemistry, he supports the Thorp and Magnox reprocessing plants at Sellafield and provides support to the NDA on options for dealing with the UK plutonium stockpile. Mark is the NNL technical lead on a European Space Agency project that defined the AMPPEX process, used to separate americium from aged plutonium dioxide, leading to the concept design of a 241Am production facility. Mark leads work within European Union FPVII funded projects and is currently a work package leader for the Government funded Nuclear Innovation Programme on advanced reprocessing options. He delivers lecture courses on the reprocessing of nuclear fuel to IAEA and UK MoD staff and is the founder and editor of the NNL Science journal. He has strong links with the University of Manchester where he is a visiting research fellow. Mark has over 45 peer reviewed journal papers and a book chapter. He is the inaugural winner of the NNL BEST award for best journal publication on the Raman spectroscopy of plutonium dioxide. University from 1986 to 2006. He is a leader in the production and application of radioisotopes for research in the physical and biological sciences. He has served on a multitude of national and international committees, including the US Institute of Medicine's Committee on Medical Isotopes (1995) and on the US National Academy of Science's Committees on the State of the Science in Nuclear Medicine (2009), the panel for the Production of Medical Isotopes without Highly Enriched Uranium (2010) and the Nuclear Physics Decadal Report 2010-2020. Most recently he served as Vice Chair for study on the State of Molybdenum-99 Production and Progress toward Eliminating Use of Highly Enriched Uranium (HEU) (2015-2016). book chapters. Dr. Ruth received a Masters of Arts in Nuclear Chemistry from the College of William and Mary in Virginia and his Ph.D. in nuclear spectroscopy from Clark University in Massachusetts. He was a Staff Chemist within the Chemistry Department at Brookhaven National Lab working with Drs. Al Wolf and Joanna Fowler from 1976 to 1980.
his colleagues he received NSERC’s Brockhouse Award for their work in producing 99mTc using medical cyclotrons. Candice Didychuk received her B.Sc. in Chemistry and a M.Sc. in Medical Biophysics from Western University. She held research positions at the Lawson Health Research Institute in London, ON and at the Sunnybrook Research Institute in Toronto, where she worked in medical imaging on the development and preclinical application of nanoparticle contrast agents for cancer targeting, multi-modality medical imaging and non-invasive cancer therapy. She is currently a Research Scientist at the Chalk River Labs of the Canadian Nuclear Laboratory (CNL), working in the Radiobiology and Health Branch. Candice’s current research focuses on (1) preclinical TAT studies in vivo using various tumour models and (2) biokinetic modelling and internal dosimetry of radionuclides, primarily alpha-emitting radionuclides, for which she serves as a subject matter expert for ISO TC85/SC2 WG-13 (Monitoring and Dosimetry for Internal Exposure). Her research has been funded by the Government of Canada, the Canadian Nuclear Safety Commission and the CANDU owners group. Her further research interests include, but are not limited to, building of collaborative efforts in the development and in vivo application of multi-purpose probes for preclinical molecular imaging in conjunction with TAT. Kevin John received his PhD from the University of Pittsburgh in 1998 and pursued his postdoctoral studies at Los Alamos National Laboratory (LANL) from 1998-2001. He presently serves as the project leader for the United States Department of Energy Isotope Program’s Tri-Lab effort at Oak Ridge, Brookhaven and Los Alamos to explore production of the promising cancer therapy isotope, Actinium-225, using the U.S. high-energy proton accelerators and specialized radiochemical processing facilities." Prof Priest, until his recent retirement, managed the Radiobiology and Health Branch at the Chalk River Laboratory of the Canadian Nuclear Laboratory (formerly Atomic Energy of Canada Ltd). Before this he was: Professor of Environmental Toxicology and Head of the Decision Analysis and Risk Management research centre at Middlesex University, London; Business Development Manager Health and head of Harwell Biomedical Research at the United Kingdom Atomic Energy Authority; research scientist at the UK National Radiological Protection Board. His first degree (Wales) was in Zoology followed by a PhD in Medicine (London). His special interest is in the physiology, metabolism and toxicity of metals including stable metals but he has wider interests in radiobiology, radioecology and analytical radiochemistry. He is a member of the Royal Institute of Biology, Fellow of the International Union of Pure and Applied Chemistry. In 2007 he was awarded the NATO Science Prize and in 2015 he was given a distinguished Achievement Award by the Canadian Radiological Protection Society. John Valliant, PhD, is a professor in Chemistry and Chemical Biology at McMaster University and the founder of the Centre for Probe Development and Commercialization (CPDC). John is internationally recognized for his work in radiopharmaceutical chemistry, where his current research focuses on developing new radiolabeling methods and compound discovery strategies to create clinically relevant molecular imaging probes and therapeutic radiopharmaceuticals. In recognition of his work and the emergence of the CPDC, John gave the plenary lecture at the 2009 Society of Nuclear Medicine meeting and was selected as one of Canada’s 2009 Top 40 Under 40. A distinction that recognizes his exceptional work at CPDC and McMaster University to advance molecular probe technology, improve patient care and spur on economic growth. Dr. Valliant has published more than 150 papers in refereed journals and conference proceedings, and has been invited to speak at scientific conferences and leading research centres the world over. He currently has 14 patents or patent applications under review. Clemens Kratochwil is the Supervising Physician of the radio-isotope treatment ward at the University Hospital Heidelberg, Department of Nuclear Medicine. The Focus of this clinical department is offering experimental therapies to oncology patients that are no more amendable with established treatment alternatives. This approach includes clinical translation of new tumor targeting peptides and other small molecules as well as targeted alpha therapy using these new or already established scaffolds. Christof Seidl is currently a research associate at the Department of Nuclear Medicine and the Department of Obstetrics and Gynecology at the Technische Universität München (TUM). He studied Biology in Berlin and Munich and he is involved in the development of new, targeted cancer therapies. His focus lies on application of conjugates composed of the alpha-emitters Bi-213 and Ac-225 coupled to carriers (peptides or antibodies) that specifically target tumor cells. Therapeutic efficacy of such alpha-emitter conjugates has been analyzed in various tumor models including gastric, ovarian and bladder cancer. Because Bi-213-anti-EGFR conjugates have shown promising results in a mouse model of human bladder cancer, TUM together with the Directorate for Nuclear Safety and Security of the European Commission in Karlsruhe initiated a pilot study to assay tolerability and efficacy of intravesical instillation of Bi-213-anti-EGFR-MAb in BCG-refractory patients suffering from carcinoma in situ (CIS) of the bladder. 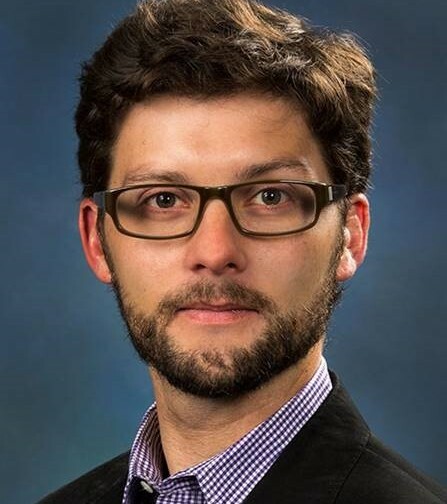 Jonathan Engle is an assistant professor and cyclotron jockey in the departments of Medical Physics and Radiology at the University of Wisconsin. From 2012 - 2016 he was employed at Los Alamos National Laboratory (LANL). His research contributed to a national supply of the alpha-therapy isotope Ac-225, to nuclear databases and theoretical models in the 100-800 MeV (incident H+) range, and to novel, large-scale production of many other radionuclides for medical research, neutrino mass measurements, environmental research, national security, nuclear nonproliferation and stockpile stewardship. In 2016 Jonathan accepted a position as an assistant professor at the University of Wisconsin, Madison, where he leads the Cyclotron Research Group. His efforts are focused on radiometals production and novel small accelerator targetry, particularly for the production of positron and Auger electron emitting radionuclides like Zr-89, Cu-64, As-72, Y-86, Br-77, Ga-68, Co-55, and Sc-44, among others.